If you’ve decided to by an LG G5, and we suspect a good number probably have or will, you’re in for an enjoyable time. Ignore the naysayers, the G5 is a unique phone in today’s flagship scene with its removable battery, wide-angle camera, and fairly minimal software that’s easy to get around and enjoy. Are you a demanding smartphone user? You might find that one 2,800 mAh battery just isn’t enough. I found during my review that, some days, the G5 didn’t last the full day, and that was a bit disappointing. In fact, for some people, running out of juice out and about can be downright terrifying (apparently there’s scientific research to back this), and if you’ve got a phone without a replaceable battery, you’re kind of screwed — you either find a place to charge your phone, or you go without. I’ve had a good opportunity to try out one of these over the last couple of weeks, and it really is a great feature. On a long day, a number of my colleagues found the need to charge their phones before the day was out, as did I. The difference being, I had no need to actually find a wall charger; I popped off the bottom of the G5, put the new battery in, and 30 seconds later, had a phone that was fully charged, with another 10 to 12 hours of power ready to go. Even last night at the Lizzies, I had a spare battery in my pocket just in case I was out longer than expected. If you’ve suffered anxiety over your phone going flat on you — and a lot of people have, it’s not a joke — then the G5 and a spare battery could be a great answer. Of course, LG G5 isn’t for everyone, and spare batteries are hardly a new solution to a new problem. 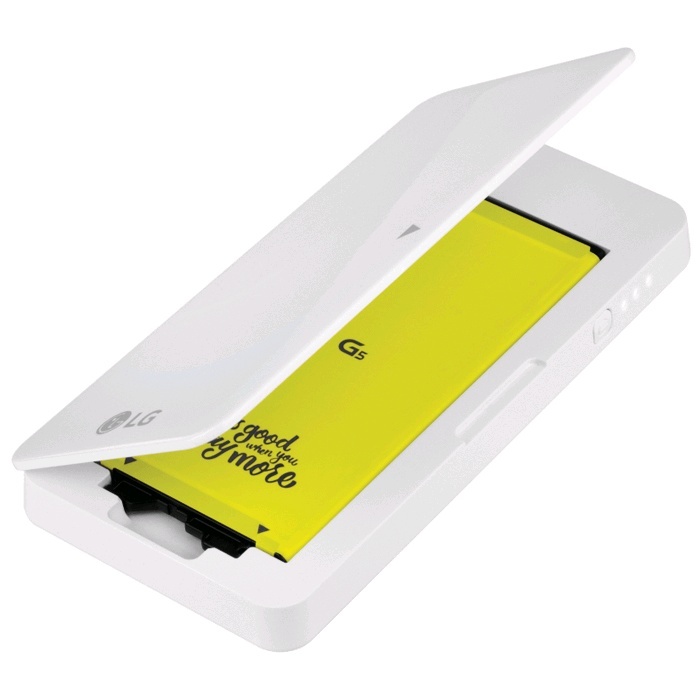 It wasn’t that long ago that most mobiles had replaceable batteries … but somehow, we’ve lost that, and it’s great to hear that for LG G5 owners, the option is there. Ausdroid’s LG G5 and battery case were supplied by LG for the purposes of review. You can get your own from Telstra stores and online (e.g. at Expansys) for around $69.